Some of the best brunch in town comes from Lalibela, an Ethiopian restaurant. 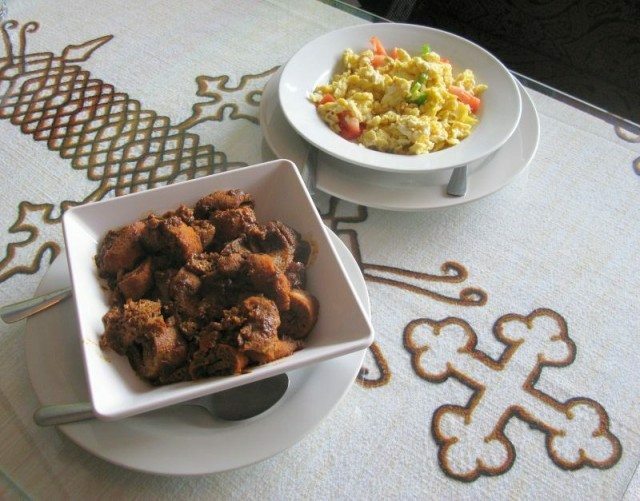 The firfir special (bottom) and scrambled eggs (top) at Lalibela. Unbeknownst to the hungover hipsters who line up at College Street diners for weekend brunch, one of the best breakfast joints in the city is an Ethiopian place on Bloor just east of Ossington. The popular dinner spot Lalibela also serves a killer breakfast—with coffee guaranteed to get you moving. Breakfast service starts at 10 a.m., and most of the items are different than those served later in the day. One excellent dish is the firfir special ($8), which is made from injera (the spongy Ethiopean bread) cooked with butter, hot peppers, and yogurt. The dish gets its punch from berbere, a curry-like spice mixture. The scrambled egg ($6) looks like any regular diner fare, but is made with lip-smacking spices and jalapeño. The kenche was another hit—it’s an airy cracked-wheat dish, similar to couscous, that’s flavoured with butter, ginger, coriander, and garlic. A server at Lalibela performs the coffee ceremony. Other breakfast dishes on the menu include foul, a mashed bean dish common across North Africa and the Middle East, and qunta firfir, a cube of dry meat that resembles jerky. There are also some interesting drinks to sample. Our waitress, Rahel, chops up some fresh ginger for tea and serves it in a glass with a regular tea bag. After we finish our meal, it’s time for the Ethiopian coffee ceremony. Rahel brings out a large metal ladle, where she roasts fresh coffee beans (as seen above). The coffee is served in a clay pot and comes with smoking incense and an enormous basket of popcorn. Syrupy and potent, it’s a great jump-start for your day. Lalibela is located at 869 Bloor Street West, with a second location at 1405 Danforth Avenue. Tel: 416-535-6615 (Bloor), 416-645-0486 (Danforth). Hours are 10 a.m. to 2 a.m., seven days a week. Spice City Toronto explores Toronto’s great hole-in-the-wall restaurants and strip-mall joints serving food from all corners of the world.